Sean Kelly announces Nowhere is a Place, an exhibition of new work by Frank Thiel. The opening reception will take place on Thursday, January 30 from 6 until 8pm. For the past two decades, Thiel has recorded the changing architectural landscape of post-reunification Berlin with densely textured, large-scale color photographs. 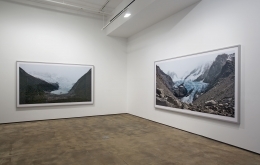 Nowhere is a Place marks the international debut of Thiel’s latest work, in which he has turned his camera on the massive glacial ice formations in Argentine Patagonia. The images that comprise the exhibition are a haunting meditation on the strength and majesty, as well as the fragility and endangerment, of the natural world. The show takes its name from a book co-written by Bruce Chatwin and Paul Theroux in 1992 about their impressions of Patagonia. Thiel visited Patagonia for the first time fifteen years ago and the overwhelming power of this extreme place stayed with him. He returned in 2011 and 2012 for several site visits and, ultimately, to create these images. 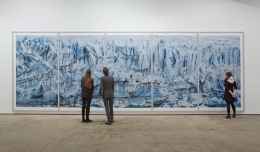 The exhibition includes one of Thiel’s largest works to date, a 30-foot long, five-panel photograph of the leading edge of the Perito Moreno glacier in Los Glaciares National Park, which is part of the Southern Patagonian Ice Field, the third largest ice cap in the world. 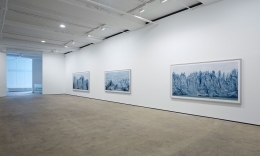 The expansive size of the photographs is crucial for Thiel, as he hopes to give the viewer an understanding of the imposing physicality of the glacial configurations and to see the seemingly endless variations in tones – from deep blue to slate grey – of the ice wall. 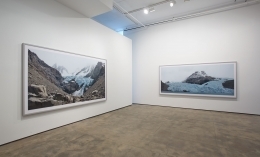 The exhibition also includes an image of the terminus of the Piedras Blancas glacier, revealing the almost lunar-like landscape of the rocky, barren ground remaining as the glacier recedes. 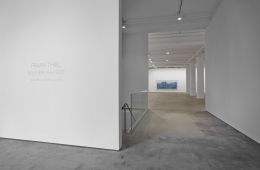 Thiel’s trademark eye for detail and composition, and his painterly sense of abstracted texture, are present throughout the extraordinary new works in this exhibition. Together the images that Thiel has created for Nowhere is a Place provide an opportunity for the viewer to experience the timeless and raw beauty of one of the purest landscapes on earth. 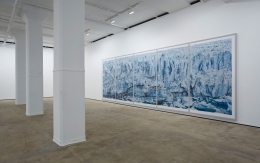 Thiel’s work is in the collections of major international museums, including: Museo Nacional Centro de Arte Reina Sofía, Madrid, Spain; Moderna Museet, Stockholm, Sweden; Art Gallery of Ontario, Toronto, Canada; Hirshhorn Museum and Sculpture Garden, Washington D.C.; and the Corcoran Gallery of Art, Washington, D.C. 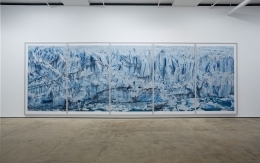 In addition to the 48th Biennale in Venice, Italy, the XXV Bienal de São Paulo, Brazil and the 14th Biennale of Sydney, Australia, Thiel has been included in exhibitions at Mori Art Museum, Tokyo, Japan; National Gallery of Canada in Ottawa; Museo Nacional de Bella Artes, Havana, Cuba; Centre Pompidou-Metz, France; Neue Nationalgalerie, Berlin, Germany; and The Phillips Collection, Washington D.C., among others. Thiel was recently invited to be a part of the second Elton John AIDS Photography Portfolio project.